Janet Kanini Ikua is the mother to a five-year-old son and a two-year-old daughter and the wife to George Ikua and resides in Nairobi, Kenya. 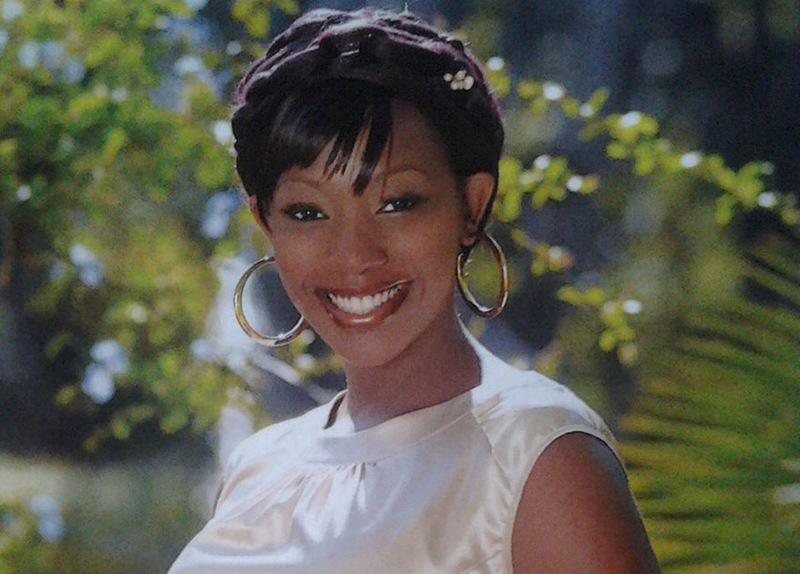 She is a TV host to NTV’s N-Soko Property Show and a former NTV News Anchor in Nairobi. Some of you may know her as Janet Ikua or Kanini or simply as Janee (say Zhanéé). Whichever name you use, Kanini is a face that many are familiar with; one we have come to love and her demeanor is characterized with big smiles and a vibrant personality. Her challenging health journey began in April of this year, a journey she has shared with many, a story that only she can tell. It has been a treacherous one; having began with a DVT diagnosis earlier in the year and ending up with one of metastatic adenocarcinoma of the lung that has spread to the abdomen and lymph nodes in the neck area. Sadly and simply put, this is stage 4-lung cancer that has spread from the primary site to other areas. The silver lining is that her medical team has come up with a comprehensive treatment plan that includes scheduled cycles of chemotherapy. 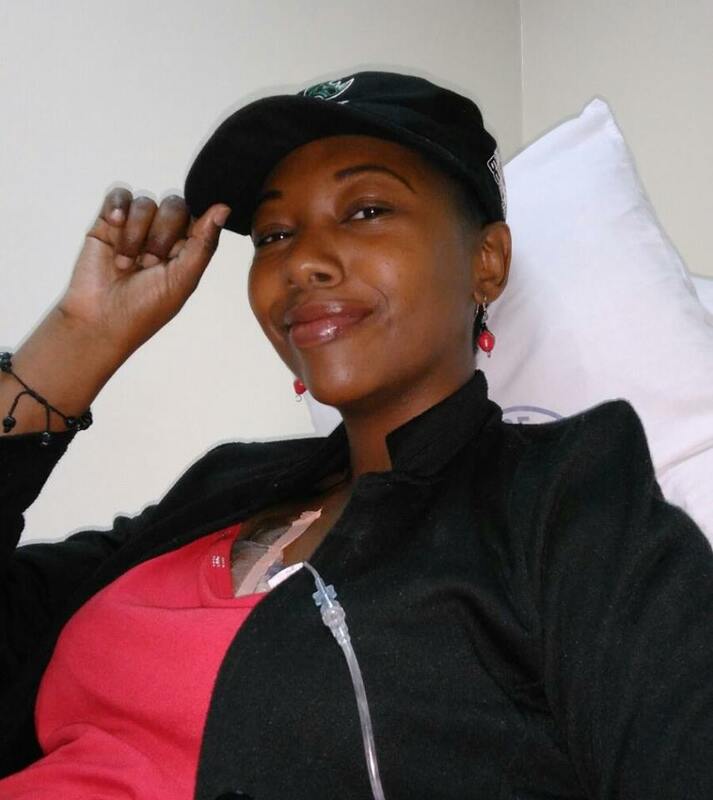 Kanini is in New Delhi, India, where she has completed her cycle of chemotherapy treatment. I looked at myself in the mirror and didn’t recognize myself, at first. I shut my eyes and then opened them slowly, taking in the image that I saw reflected back. A young mother and wife, sporting the latest physical evidence of a medical journey that has now lasted almost 9 months. What people refer to as the body’s ‘crowning glory’, is gone. When I was 9 years old I told my Mum to chop off all my hair because I was a tomboy and liked the convenience of climbing trees and shooting my Dad’s bow and arrows without bothering about dirt, grass and leaves in my hair. But on becoming a teenager I begun to place a lot of value in it, like most ladies, and so I can’t lie that losing it now hasn’t made me feel a little sad. Enough with the self pity! I have decided that this hair loss, for me as a cancer victor, is symbolic. Symbolic of getting rid of my old self and being renewed. Symbolic of the spiritual rebirth that I have experienced ever since I completely surrendered my life to God in October, in India, when I was down to nothing and the only thing I could say about my future was “I don’t know. God help me. I don’t know what to do next.” Once I surrendered God allowed amazing things to happen, something I remind myself and loved ones about whenever we wonder about my future. 2 Corinthians 5:17 says “Therefore, if anyone is in Christ, the new creation has come: The old has gone, the new is here!” Sometimes God allows drastic things to happen to us so as to make us realize that we truly, honestly, can only depend on Him for life. For the very air that we breathe. For strength to get through each day. For the guarantee of salvation. For wisdom to see the best choices to make and path to take in this world that can get murky and confusing as we attempt to live up to a secular status quo. I wondered why other people were telling me “Janet I’m healed!” and yet I’m still on this journey. Reverend helped me realize that God’s timing is not ours. God’s plan for someone else isn’t necessarily the same for me. And their news does not mean that my faith isn’t adequate. I should stay steadfast and do what God commands in His word and one day I will see that the situation was for the best. There is a reason for every season. Perhaps I am going through this so as to fully understand what DVT and cancer patients endure? So that I can help them in a knowledgeable manner? So that I can finally understand the cancer battle that my late father went through 8 years ago before he went to be with God 2 weeks after my wedding? As humans it’s so easy to wonder and over analyze and debate but at the end of the day, I personally find peace only after reading the Bible. Escape into the word. Shout it out loud! Ask other people affected by cancer which scripture gave them strength. Do not be afraid to voice your skepticism – that’s why fellowship is important so that we lift each other up to continue running the good race. Did any of you notice the full moon on Christmas night? It was exceptionally full and bright, so bright that on camera its image came out resembling a cross (see attached photo). We stood with our neighbours, watching the sky in awe, thinking of the brilliant star that led the wise men to the stable where Jesus was born. A shining reminder of the significance of Christmas as the birth of our Lord Jesus by whose stripes I am healed! The older kids taught the younger ones about constellations, pointing out Orion, the evening star and others, mounted on a pitch black sky. Beautiful. I discovered that to lift my mood it helps tremendously to do the things that have always made me happy, especially those dating back to my younger days. As we age and we tend to get caught up in the demands of our new phases of life. I have always enjoyed dancing, so on Friday December 18th I purposefully put on dancing shoes and party clothes to look like a manyanga for hubby, popped a few painkillers and went to Carnivore for the annual pre-Christmas New Jack Swing. Some friends joined us and it was great laughing at how unfit we’ve become, we couldn’t dance for long, yet in our early twenties we’d be the first ones in the club, spend the night dancing non-stop and drinking water with ice coz that’s all we could afford, then waiting for sunrise to slowly walk to the bus stop on Langata road before crawling into our respective homes, exhausted but happy. This time round we managed to do some ‘shoulders’ and ‘pirate’ lakini ‘Hammer Time’ ilituweza – we admitted defeat before slowly walking back to our seats. grin emoticon At least I had worn a wig so that guys on the dance floor wouldn’t get shocked at seeing my hair flying off my head in the middle of the song “Pump up the Jam”! gasp emoticon Back home I created an 80s playlist of songs whose lyrics I used to write in a special song book, as our neighbour admitted that he would write the lyrics on special paper before spraying cologne and giving a girl he liked in school LOL! Growing up was fun :)) As the songs played I insisted on telling my kids that “You know I used to be in dance groups in church and campus!” One day I’ll teach them all the old moves…. So, look for what made you happy in your carefree days. Rolling a tyre, playing marbles, hopscotch, kati, cards…be a kid again! Even if you’re 70! We are all God’s children after all! And don’t care what anyone else thinks of you. I have faced death and learnt that caring what other people think about me, when I haven’t done anything wrong or hurt anybody, is a waste of precious seconds that could be spent on positive energy. Don’t let the devil steal your joy. Ever. Tomorrow I have another reason to praise God – tomorrow is my 38th birthday! Doc says I’m allowed some cake as long as I eat a balanced diet (yaaaay just a lttle!). :> As per Monday’s blood test results I’m slightly anaemic, my haemoglobin levels are kidogo low, so my focus is on building iron with red meat, liver and green leafy vegetables for the next one week. So if you want to give me a birthday present, leta mbuzi!